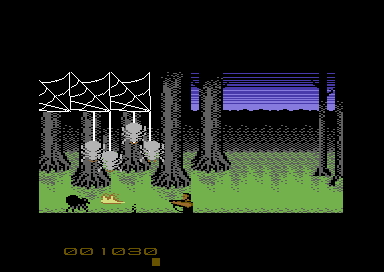 Another Alf Yngve game, this clone of 1983's getting-messily-killed-by-spiders simulator Forbidden Forest sees the player making a return to that gribbly-infested hellhole packing a flamethrower in place of the original's bow and arrow. Forgotten Forest does a good job of recreating its predecessor's sense of tension and impending doom, and replaces the nightmare fuel death animation where the player is spider-stomped to death in a shower of pixellated gore with a more SEUCK-friendly sequence of the player crumbling away and being replaced by blood red lettering spelling out "YOU DIE". The bad guys come thick and fast, and with SEUCK's limit on the amount of shots you can have in the air at a time Forgotten Forest demands a conservative attitude to the fire button and removes any hope of just stomping through with the trigger pressed. The gameplay flips between frantic and tense, with giant hovering bees that flit about the screen ominously before their mates come and swarm you to a messy death. Cosmetically the game is nicely done as well. The graphics are well put together, with blink-and-you'll-miss-them details like evilly glowing eyes on the spiders that race towards you, and the theme tune is worth leaving the title screen running for. Definitely the least serious game in the running for the prize of a Richard Bayliss makeover, AotAC is a game about one man's quest to go to the pub without having bottles thrown at him by young offenders. Which, to be fair, most of us have gone through at least once in our lives, so it's also arguably one of the most realistic games in the contest! This game is hard as nails. It's monstrously easy to get killed in AotAC. Bottles and deadly notes of crap music fly at warp speed and game designer Joshua Green in a sadistic move has made them incredibly hard to dodge - it's all down to whether or not you can coconut the ASBO kids in the face before they can glass you at long range! The graphics are bright and blocky, and bring back really vague memories of an educational game I'm sure I recall playing on a BBC or Acorn Electron in school, and the gameplay, while absolutely brick hard, is pretty rewarding simply due to its difficulty. I've yet to beat this game, and I have the feeling that if I didn't have to write about another game right now I would fall into a vortex of "just one more go" and end up still awake the wrong side of tomorrow morning, simply out of sheer bloody-mindedness. It's clear from the title alone that Pav Loda's game is a SEUCK take on perennial arcade classic Defender, and Deff-Ender does its level best to cram the two-way scrolling gameplay of the original into the one-way scrolling of SEUCK. Apart from the ability to go both ways (tee-hee) the game ticks most of the Defender boxes. Little guys running along the screen needing to be rescued, green aliens trying to abduct them and the minimalist backdrop of a single green line forming distant mountains are all there, as Deff-Ender joins several other games in this contest in proving how versatile the SEUCK engine is. Gameplay is suitably fast for a Defender clone, and Pav has crammed as many bad guys into the game as possible without too much lag or slowdown. Around the end of level two things do begin jerk a little, but it's to be expected and frankly takes nothing away from the quality of play. You really can't beat a good Defender clone, and this take on the classic is definitely a good Defender clone. 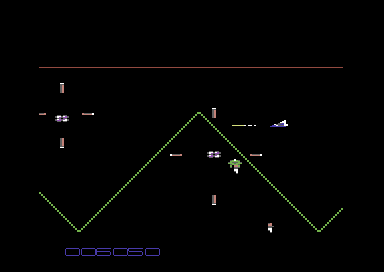 Along with fun, speedy gameplay Deff-Ender has suitably Defender-ish graphics and a pretty cool theme tune, and a challenging array of enemies to blast into tiny, tiny bits. Totally unrelated to Deff-Ender, and produced by Christian Siege, Action Def has more sedate and trickier gameplay than many of the games in this year's competition. Action Def, the titular character and blue-skinned hero, has to negotiate a series of traps on a perilous mission through a run-down city. For a game made with the Shoot 'Em Up Construction Kit it's very light on the shooting - Action Def doesn't even have a ranged weapon, opting for a whip to lash his enemies into submission, and heavy on the trap avoiding. After playing a load of shooters it's a nice change to pick up a game like Action Def, and like other games in the contest it shows what can be done when SEUCK is combined with effort and imagination. The gameplay is pretty punishing at times, but not in an excessive way, and it adds to the challenge. As the instructions on the contest website say, the game really does require precise timing to get very far at all. Seven games are now contending for the prize of being reworked into a special enhanced edition with extras such as bonuses and an improved front end. Voting ends on 6 August, and all the games in contention can be downloaded for free here (from the TND website). To play them on a modern computer, you'll need a copy of the VICE emulator too (freeware).